But the number of retweets needed to unlock the ad before it breaks on August 7 does not appear to be on-track. 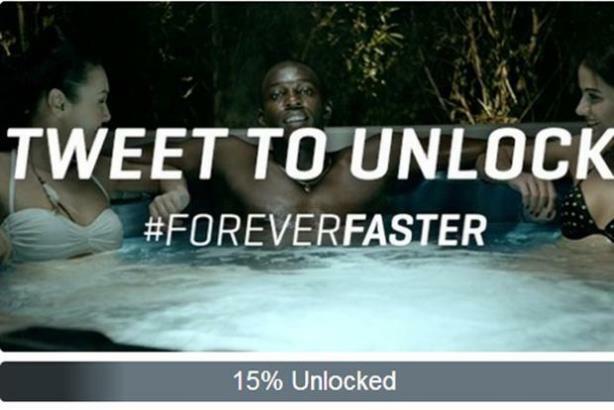 HERZOGENAURACH, GERMANY: Puma has signed up for Twitter's "flock to unlock" ad platform, enabling consumers to access its latest advertising days before the official launch, but with content only activated once a sufficient number of users have retweeted. The sportswear brand kicked off the initiative on Tuesday, with teasers referencing a TV ad that consumers will in theory be able to watch online before it goes live on-air. At the time of writing, the campaign was only "15% unlocked," with retweet numbers in the hundreds rather than thousands, according to a graph on Puma’s Twitter account. To raise awareness of the "flock to unlock" aspect of the campaign, Puma-sponsored athletes were recruited to tap into their Twitter fanbases. They include sprinter Usain Bolt and footballer Mario Balotelli. The effort is part of Puma’s Faster Forever campaign and was created in conjunction with Twitter and DigitasLBi. Faster Forever was launched at the start of 2014 to align Puma’s sportswear and lifestyle products under a single global banner. Earlier this year, Puma was named as the new jersey partner for Arsenal, ending rival Nike’s two-year sponsorship of the UK Premier League team.